I often go looking for the next delicious thing to try (I won’t stop till I’ve tried All The Things! ), but sometimes it finds me. I’m never one to pass up the opportunity to try fresh and local food, and so when entrepreneur Mario Garisto reached out to discuss his new sausage production venture, Sorella Toronto, I was intrigued. I also couldn’t say no to the chance to try a 100 year old Italian sausage-making recipe. Really, who could? I met with Mario this winter to discuss his new business, and the fine art of making sausages. He also shared some thoughts with me after our face to face chat. Mario was once in sales and realized that the key to his happiness was doing what he loved, for himself. He grew up in a traditional Italian-Canadian household that naturally focused on good food, and learned at an early age how important it is to make good sausage. Q: How old would you say you were, the first time you participated in making sausage? Mario: I was 10 when I was old enough and tall enough to turn the hand grinder at my Nonno’s house. I would hang around the table looking to help and was called up to the big leagues to turn the crank. This led to helping butcher, spice, weigh and tie the sausages. Q: How long has this recipe been in the family? Is there a particular history to it? 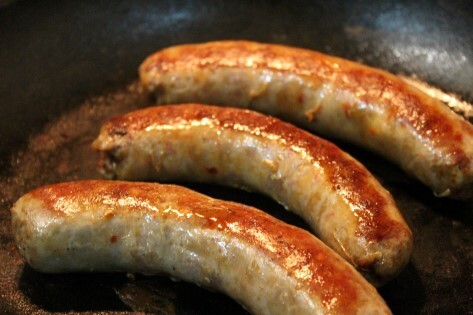 Mario: The sausage recipe comes from my great grandmother (who is 100 years old and thriving). The story is simple – a very southern Italian family from a town of 1000 people who take great pride in their prepared foods. This has been passed down to all members of my family. He decided to go into commercial sausage production and he spent a lot of time researching supplies to ensure the quality he’s used to and wants to share. He butchers the Toronto pork himself and uses cases from The Healthy Butcher. To add heat he uses dried and crushed chilies. The recipe is simple, but Mario believes that his pride in materials and the process makes for an amazing sausage. Q: Why has no one marketed the recipe before now? Mario: We have never been able to get it off the ground because my parents and extended family had other priorities. It has always been a dream. 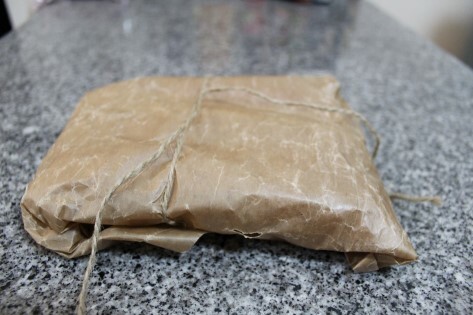 We use to sell it at our door to the neighbors with fantastic results. I am making the dream into a reality. He was kind enough to share samples with me – bringing the raw sausage to me directly to ensure maximum freshness! He brought his three spice levels: Mild, Hot and Garisto Hot (not for the faint of palate). He had a number of preparation recommendations for me but ultimately I decided to go with the good old pan-fry. 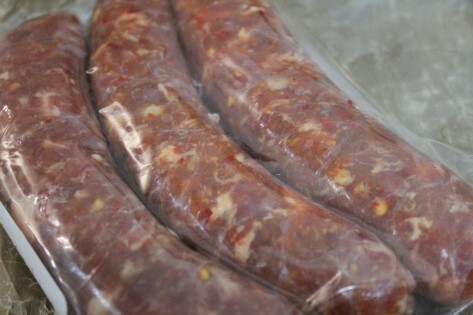 He adds no fillers, no preservatives to the sausage – they are solely fresh, high-quality pork (and the chilies). A slow fry releases the oil from the chilies for maximum spice but (as he had promised) very little moisture left the sausages as they cooked. This meant that even after they were fully cooked they hadn’t dried out and remained juicy. I served them up with some fried onions and beer (on Mario’s welcome recommendation). 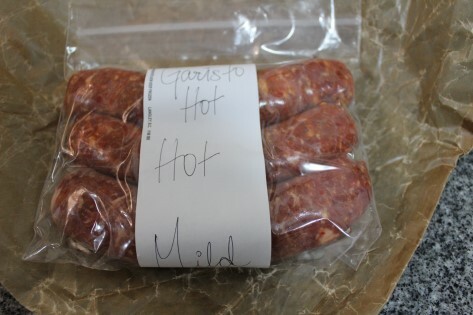 I found the jump from Mild to Hot wider than from Hot to Garisto, but since I ate all three together I eventually just enjoyed the heat. I have a personal distaste for most ground beef as I can’t abide gristly bits, but these pure pork sausages were perfectly satisfying. On a bun with a brew they’d be the perfect lunch. Q: How have your production plans progressed? Have you made many sales or deals yet? Mario: I am currently looking for a proper location to open Sorella Toronto and have a sausage on a bun attached to my wholesale plan. I have made sales that indicate a desire for #mariosmomssausage and am always asked when I am going to be in full production. I have 250lbs in standing orders to date. Q: Who are some of your culinary influencers? Mario: My grandparents, mother, and aunts from a family perspective (note: Sorella means ‘sisters’). Also my best friend Peter Badaj who is a cook at the AGO. We have known each other for 15 years and he continues to educate and perfect my skills. I am always seeking out new inspirations. Anyone who is living their dream as a cook, chef or restaurant owner has my envy and best wishes. Interested in Sorella Toronto and #MariosMomsSausage?